The Fulbright program here in Finland encourages mentoring through “big brother” kinds of relationships. Unfortunately, there was no one up here in the remote north to assign to me. So, my Fulbright buddy is in far-away Jyväskylä. That’s okay, because we maintain regular email contact, and he has invited me to visit, which is great because Jyväskylä has been on my list of places to see from the start. That’s because of Alvar Aalto, the architect sometimes referred to as the Finnish Frank Lloyd Wright. I’ve been reading up on Aalto, and I think I understand why some people question the aptness of that comparison. Most of them regard it as demeaning to Aalto. 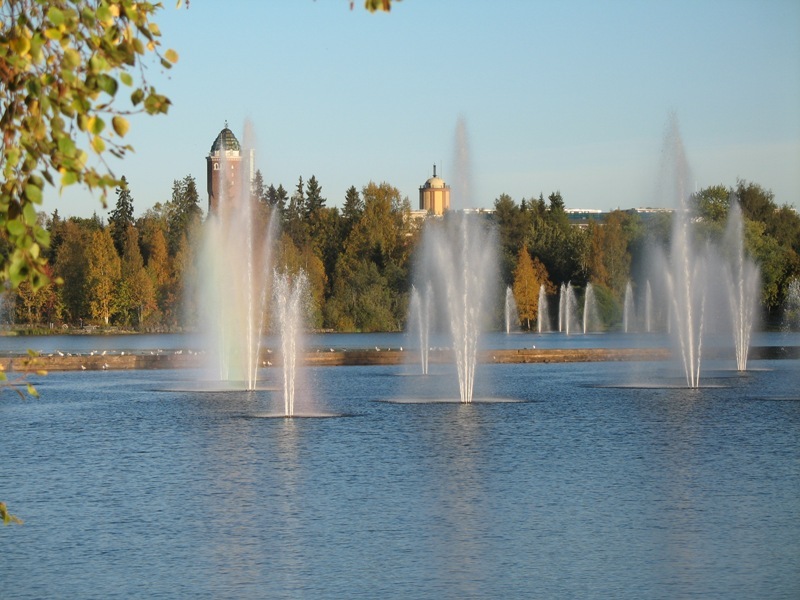 His roots were in the south-central part of the country, and he did a great deal of work in and around Jyväskylä. The Alvar Aalto Museum—it’s in an Aalto building—is there, and the local university boasts a number of his buildings. Jyväskylä is a major pilgrimage destination for architecture buffs, even though Aalto’s work can be found all over the country. For that we have mainly the Germans to thank, for they torched many of Finland’s cities as they withdrew from the country at the end of what Finns call the “continuation war.” Some cities were devastated. For example, Rovaniemi, the Santa Claus city a couple of hours north of Oulu by train, was left in ruins and had to be rebuilt from scratch. Aalto drew up a city plan in the form of reindeer antlers. It sounds ridiculous to me, but I will try to suspend disbelief until I see it for myself after the semester ends. The damage done to Oulu seems to have been severe, but not on the level of Rovaniemi. I have learned that in 1943-47, Aalto was brought in to design, or re-design, the part of Oulu that lies along the river bank adjacent to my neighborhood, Tuira. The river itself seems to have been reconstructed on several occasions. Nineteenth-century lithographs reveal serious whitewater in the rapids (koski) at this spot. At some point a new channel was dug to bring the river through a power station that I walk or bike past twice a day. What’s left of the rest of the river flows through what I suspect is the original channel. There is parkland on every side. There is even a beach where, any day of the week, lunatics can be seen swimming. There is an island near the north shore and adjacent to the power plant. I don’t know if this island has always been there, or if it was fashioned at the same time that the power plant was constructed, which was in 1948. I also don’t know the extent to which Aalto was involved in all this. But all the sources I have seen agree that he designed the “general plan” for a residential area, called Toivoniemi, on the island with the power plant. Toivoniemi is an International Style “park” punctuated with ‘50s-era residential towers, rather nice ones, it seems to me, though none is attributable to Aalto. I get the impression he was responsbible only for the landscape. And perhaps part of the riverscape. On the day that I arrived in Oulu, I was met at the airport and driven to my flat. The city looked pretty much as I had expected it to look, in part because it is completely flat, like a map. As we crossed the bridge over the Oulujuki approaching Tuira, I saw something I didn’t expect. There was a place in the river where a dozen fountains or more had been set to propel jets of water many meters high—a kind of water sculpture. At first I was struck by the sheer frivolousness of fountains in a river. Over time, as a pedestrian and bicyclist, they have grown on me. They would have cost something to install, of course, and operating the pumps consumes energy, but I would guess that lighting represents the major expense. Yes, the fountains are illuminated at night; it makes for a nice show. Think how many city residents and guests, over sixty years and counting, have derived pleasure from these simple fountains. Thank you, Mr. Aalto, if in fact you were responsible for this urban amenity. Now, bring on those urban reindeer antlers! Click on the title of this post for a tour of the Alvar Aalto Museum.